Les monts Troyens ne foulent de gambades. Cessent leur rage, et ne sont plus malades. Et de ses yeux tousjours le cœur me poind. Cease their madness, and are ill no more. And with her eyes my heart always wounds me. What of all these names? The Maenads are famous from Euripides’ play of the same name: followers of Dionysus/Bacchus, as were the ‘wine-soaked Thyades’. Maenads (=’maddened ones’) certainly came from or worshipped in the hills, but not specifically Trojan hills. Both were known for the frenzy of their celebrations, ecstatic dancing leading to trance and the loss of inhibition – often leading to violent excess. Corybants were followers of Cybele (another Asian goddess – the Greeks always viewed Asia with suspicion), and Curetes of Rhea – who is often in turn associated with Cybele. They too were known for their ecstatic rites, or as Muret footnotes it ‘when they sacrificed they were seized by a madness which made them run, shout & jump as if out of their minds’. Minor variants in Blanchemain: here’s the whole poem again to avoid a string of picky amendments. Note how in lines 2 and 7 this earlier version had in-line alliteration which Ronsard later chose to make much more subtle by simply switching the words. Et de ses yeux tousjours le cœur me point. Esbattre la fleur de nos ans. Que d’un or tant soit precieux. Il boit au plus chaud de l’esté. May meet in drinking some kind of end. To frolic away the flower of our years. Which has nothing of him but his name? O Rose, and I am not singing of you! The violet of Cypris (=Venus). She borrows from the dawn. Than with gold however precious. Is there anything beautiful without her? And the morning Sun is rose-pink. Encircled by a hundred roses. Beneath the arbour in the hottest days of summer. In the 5th stanza, Charon is the boatman who ferries dead souls across the river Styx; I can’t recall anywhere else where the image is of him fishing them up in his net! In the 9th stanza, ‘rosy-fingered Dawn’ is how Homer always terms her. In the penultimate stanza the ‘twice-born’ is Dionysus, or Bacchus as in the final stanza. Why twice-born? Well, Bacchus was the child of Jupiter and Semele; those who know the Handel opera will know Semele died as a result of seeing Jupiter in all his glory – before giving birth. Jupiter then took her unborn child (a ‘six-month child’ according to some Greek writers) and sewed it into his thigh to complete its growth until ready to be born. Hence ‘twice-born’, once from Semele’s womb, once from Jupiter’s thigh. Aubert in the 2nd stanza is Guillaume Aubert, friend of du Bellay & posthumous editor of his works. Que poudre je n’aille là bas. Ny quand mon âge doit finir. Fuyez-vous-en bien loin de moy. Je n’ay que faire avecque vous. From going below as dust. Nor when my time will end. I have nothing to do with you. Blanchemain puts at the front of his edition of the ‘Odes retranchées’ this poem. It starts so strongly, and that opening line cries out to be quoted regularly and often! I wonder why Ronsard removed it from later editions? Perhaps it is because the last stanza is relatively weak and unfocused – but only relatively. Au milieu de notre esperance. Ne luy viennent plus en pensée. Hé ! quel gain apporte l’esmoy? Un lict de roses espanchées. Entre les pots et les jonchées. Et cent fois leur pendre la coupe. L’esté dessous l’ombre des treilles. In the midst of our hopes. No longer come to his mind. Ah, what gain does worry bring? A bed strewn with roses. Among the strewings and chaff. And offer them the cup a hundred times. All summer under the shade of the vine-arbour. 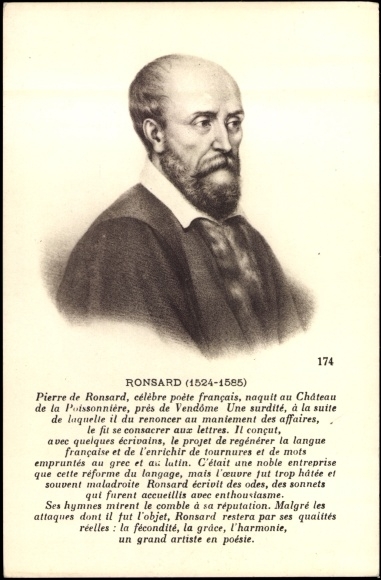 As well as the usual classical references, here Ronsard refers to his own contemporaries and friends, other poets in the group which called itself “La Pléïade” (after the cluster of stars, and a famous group of Alexandrian poets: a bold move, particularly as the Alexandrian Pleiad included the enormously influential poets Callimachus and Theocritus, as well as Lycophron and Apollonius of Rhodes!). Jean Daurat (or Dorat) and Étienne Jodelle were among its minor members; “the whole troop of the Muses’ followers” is of course the Pléïade. Anacreon was a Greek lyric poet, born in Teos, whose style Ronsard set out to imitate, and whose content he sometimes adapted too: see, for instance, Ode 20 in book 4. Last, Henry Estienne was a publisher and scholar, who edited and issued many Greek texts in print for the first time. De fleurs le chef m’environne. Du demain je n’en ai point. Si un lendemain doit estre. Ou de lierre, ou de fresne. Des assauts ni des combas? Peins-y des fouleurs de vins. D’un Silene et d’un yvrongne. I have no envy of kings. Of flowers around my head. For tomorrow I don’t care at all. That tomorrow will really come? Paint there the treading of the grapes. Of a Silenus and a drunkard. (translation by Ian Johnston, mala.bc.ca). Ronsard’s poem is the immediate source of the poem ‘Upon his drinking cup’ by John Wilmot, Earl of Rochester (though his last line unsurprisingly goes for the crude shock word; very unlike Ronsard!). Both Ronsard and Rochester go back ultimately to Greek originals by Anacreon: Odes 17 & 18 in older editions, more recently relegated to the ‘Anacreonta’ (nos. 4-5) i.e. pseudonymous works in the style of Anacreon. Ode 17 is a far better work than ode 18; though the latter contributes a few ideas, the bulk of Ronsard & Wilmot’s ideas can be traced to ode 17. For what have I to do with battles? As deep as you can. For what have I to do with the Pleaides? Or with the stars of Boötes? Together with fair Lyaeus [Bacchus]. Here is Ode 18, which has the same title. The sweet cup of Spring. The rose, delightful to us. Make me a delightful drinking-cup. Who has charge of weddings. If Phoebus [Apollo] is not playing there.